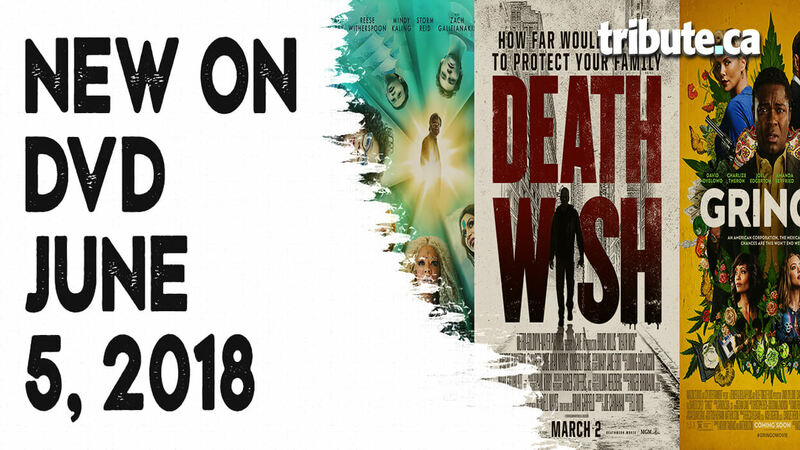 Features > New on DVD – A Wrinkle in Time, Death Wish and more! Grab the popcorn! This week’s new DVD and Blu-ray releases offer hours and hours of entertainment, from the family sci-fi adventure film A Wrinkle in Time to Bruce Willis’ action thriller Death Wish. Which new release are you most excited about? A Wrinkle in Time – Based on the novel by Madeleine L’Engle, this film follows Meg Murry (Storm Reid), her brilliant younger brother Charles Wallace (Deric McCabe) and their misfit friend Calvin (Levi Miller) on a wild expedition in search of Meg and Charles’ missing physicist father (Chris Pine). Along the way, they meet three supernatural beings: Mrs. Whatsit (Reese Witherspoon), Mrs. Who (Mindy Kaling) and Mrs. Which (Oprah Winfrey), who help transport the children to an alternate dimension. Death Wish – Surgeon Dr. Paul Kersey’s (Bruce Willis) wife Lucy (Elisabeth Shue) and daughter Jordan (Camila Morrone) are brutally attacked during a home invasion while he’s at work. Although Jordan survives, Lucy dies and Kersey feels like a failure due to his inability to protect them. When the police don’t seem to be putting much effort into tracking down the killers, Kersey decides to find every single man involved and hunt them down. His vigilantism makes headlines as his efforts also help other people from getting hurt by the same men. Daphne & Velma – Daphne Blake (Sarah Jeffery) moves to Ridge Valley, where her best friend Velma Dinkley (Sarah Gilman) lives. The two attend Ridge Valley High together, and when their classmate Spencer begins acting strangely, the girls team up to investigate. Every Day – A shy 16-year-old girl named Rhiannon (Angourie Rice) finds herself attracted to a mysterious soul named “A” who wakes up every single day in a different body — sometimes male, sometimes female, sometimes white, sometimes another color, but always the same age. Feeling a connection, Rhiannon and A try to find each other every day, but Rhiannon never knows what to expect or what body to look for. As they fall in love, the realities of loving someone who is a different person every 24 hours takes a toll. Gringo – Harold Soyinka (David Oyelowo) is having financial problems. When his company sends him to Mexico to deliver a “weed pill” that they’ve invented, he jumps at the chance to travel. However, once there, he’s kidnapped and when he calls his business colleagues back home, they are less than sympathetic. It seems that they sold a product to the local Mexican cartel, but then cut them off. Harold battles to survive his increasingly dangerous situation with little help from the company that put him in the position in the first place. The Hurricane Heist – A gang of thieves plan to take advantage of a hurricane evacuation to steal $600 million that’s about to be shredded from a U.S. treasury facility in Alabama. However, when the storm blows up into a lethal Category 5 and their well-made plans go awry, they end up taking a hostage named Breeze (Ryan Kwanten). His meteorologist brother (Toby Kebbell) and Treasury Agent Grace (Maggie Grace) must work together to free Breeze and defeat the bad guys. Thoroughbreds – When a wealthy, sociopathic teenager named Amanda (Olivia Cooke) loses all her friends after she kills her horse, her mother hires Amanda’s ex-best friend Lily (Anya Taylor-Joy) to hang out with her. The prim and proper Lily hates her wealthy stepfather Mark, so when he decides to send Lily to a boarding school for teenagers with severe behavioral problems, the two girls decide to get rid of him. They blackmail Tim (Anton Yelchin), a lowly drug dealer, into committing the murder for them. Peter Pan Anniversary Edition – For a limited time, the 65th anniversary edition of the beloved Disney classic is available on Blu-ray and DVD. The animated musical, based on the novel by James M. Barrie, is about a little boy named Peter Pan, who never wants to grow up. One night he meets the Darling children and convinces them to join him on a trip to the magical world of Neverland.